A few weeks ago, I accompanied my friend Chow for lunch at Krua Apsorn. Chow, who is the author of Bangkok’s Top 50 Street Food Stalls, was researching restaurants for an article in an Australian airline’s inflight magazine and needed an extra mouth to help her evaluate the food. Who am I to shirk my duty as a friend? Krua Apsorn is a Central Thai style restaurant that has garnered much attention in recent years. With a homey charm, decent food, and a slightly obscure location, it is the type of place that makes foreigners feel like they’ve stumbled into a secret cave of culinary treasures. While it is worth a visit, I wouldn’t necessarily put it on my list of “must-visit” restaurants. 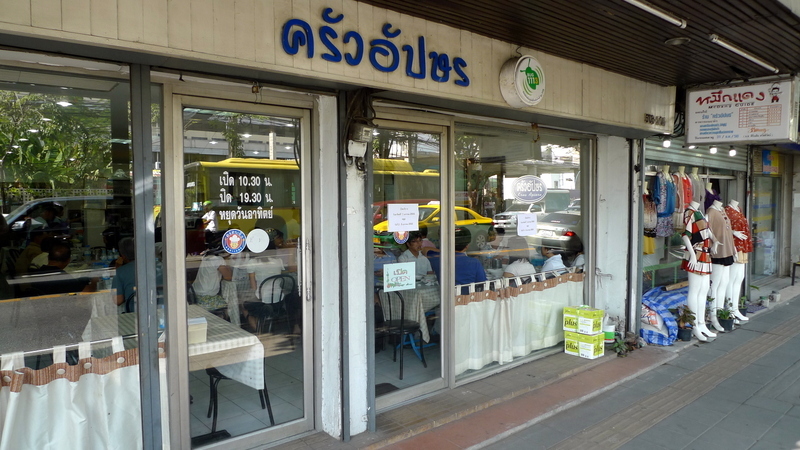 The original location of Krua Apsorn (there are now three) is on Samsen Road, which runs north from the Khao San backpacker district towards the Dusit Palace. Located a little ways past the National Library, the restaurant is off the beaten path for most visitors but not terribly difficult to reach. The chef used to cook for the King’s now-deceased mother and older sister and when this restaurant opened, Princess Galayani was known to visit it. Six years ago, the Bangkok Post named it one of Bangkok’s best restaurants and you can now find it listed in nearly every guide book. Lunch reservations are recommended as this location is popular with large groups of office workers. The interior is modest and the emphasis is on the food rather than the decor. The staff is friendly although rushed and it took a while for us to get their attention to order and then again to get the bill at the end of lunch. To ensure we gave the restaurant a fair sampling, we brought tremendous appetites, ordering and (for the most part) finishing more dishes than you would think two people could eat. 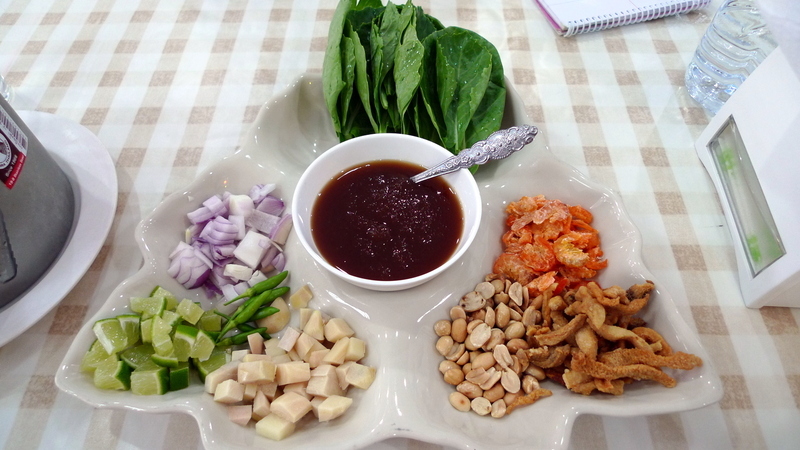 We started with a classic Central Thai appetizer: miang kana. 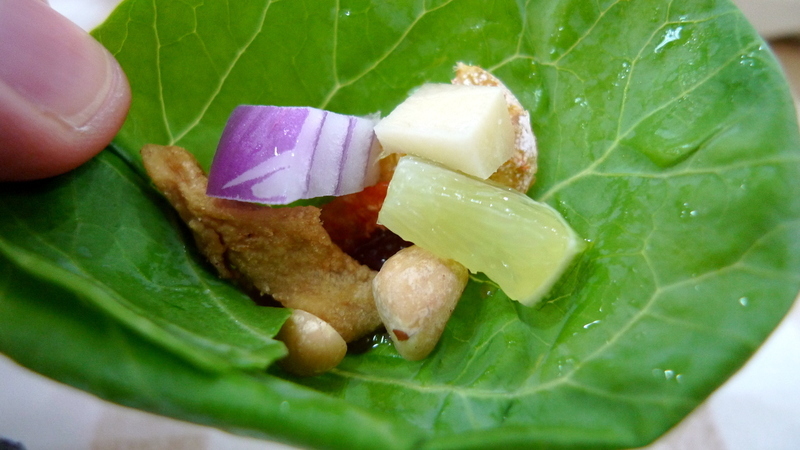 These make-it-yourself appetizers feature a variety of sweet, sour, spicy, savory, and salty tidbits that you wrap in a kailan (or Chinese broccoli) leaf with a splash of tamarind sauce. Can you spot the following items? Shallot, lime, white ginger, peanut, dried shrimp, and fried pork rind. Combined with the tamarind sauce, this appetizer exemplifies the typical flavor profile that Thai dishes aspire to, a balance of different flavors that leave you very satisfied. While I’m leery of ordering mussels thanks to a bad experience years ago in Seattle, we couldn’t pass up this dish that sat on nearly every other table. 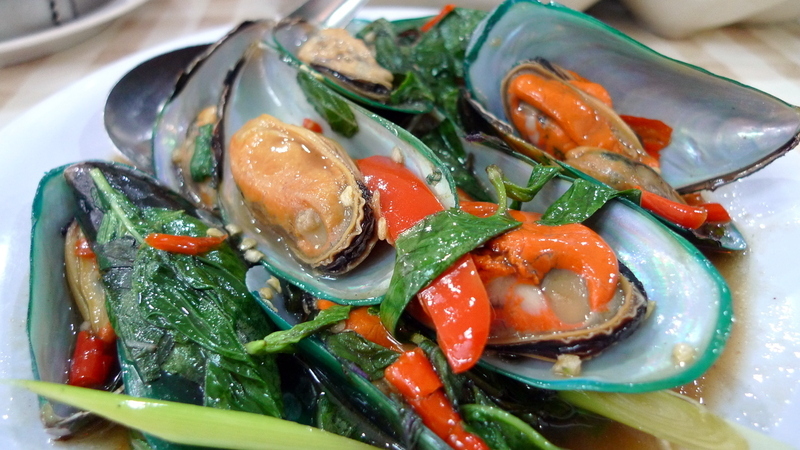 Called hoi malang puu pad chaa, these super fresh mussels were stir-fried in basil, fish sauce, and chilies. At first they didn’t seem too spicy but trying to avoid the chilies was a challenge and eventually you just had to give in and enjoy them. 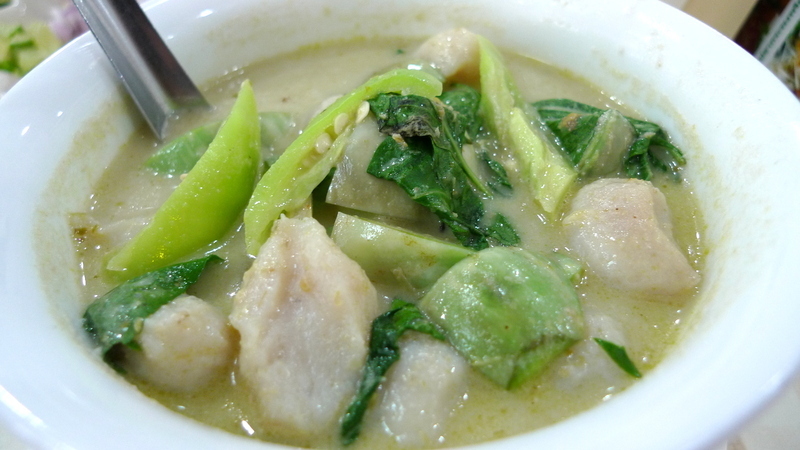 Another dish was gaeng kiaow waan luuk chin plaa, green curry with fish balls. Green curry is one of the more accessible types of curry for foreigners’ tongues. This one was passable but the taste was watered down. 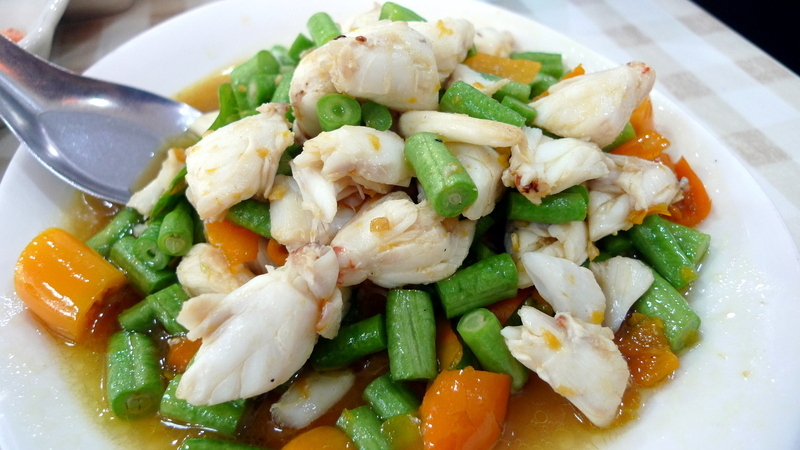 A dish for which the restaurant is famous is neua puu pad prik lueang – crabmeat stir fried with yellow chilies and long beans. The portion of lump crabmeat is generous, fresh, and sweet. The sauce itself is also a little sweet, almost tasting as if it had ghee added to it, although I doubt it does. The long beans were a little undercooked for my taste – reminding me of how when I brought my now-deceased paternal grandmother to eat Thai food once, she commented on a dish of stir fried vegetables, “My, they certainly like their vegetables crunchy.” All in all, this was a well-made dish, though, and one I would order again. 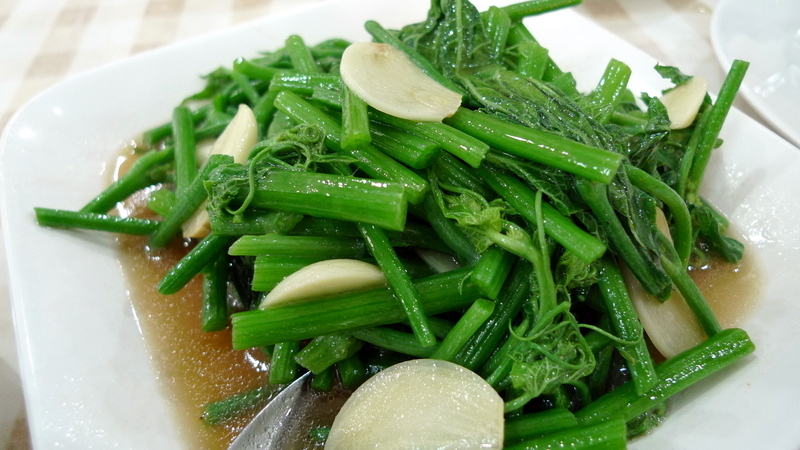 A dish of pad yot pak maew – chayote stems fried with garlic – provided a simple and refreshing contrast to some of the other, more strongly flavored dishes. 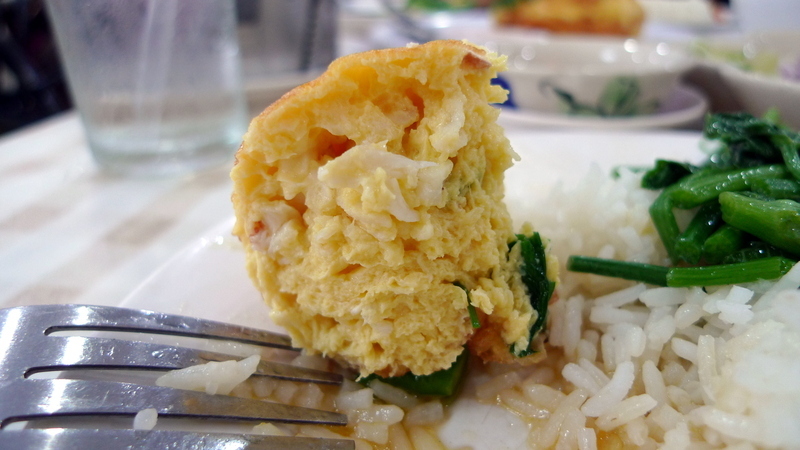 Another highlight from Krua Apsorn’s menu is kai fuu puu – crabmeat omelet. Their version, however, is so unlike the omelets you see elsewhere that it really makes you take notice. 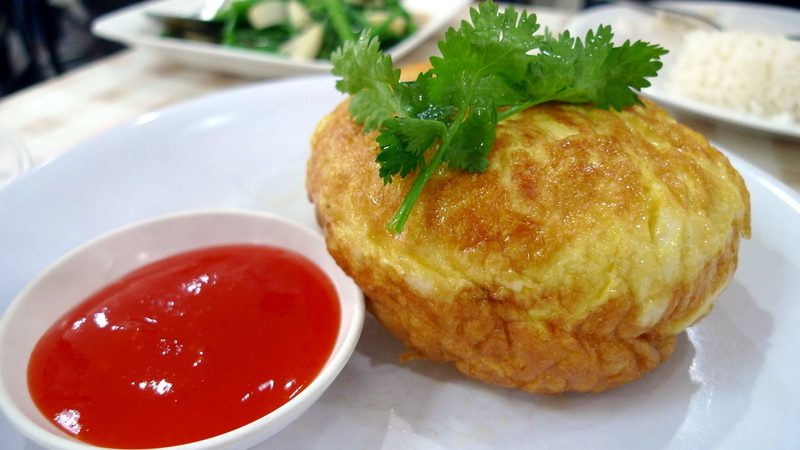 Cooked in a narrow dish rather than a broad skillet, the omelet gains a lot of volume, looking more like a souffle than a traditional Thai omelet. Cross section of the kai fuu puu – standing very tall. That said, the amount of crabmeat in the omelet seemed skimpy when compared with, say, the amount of crabmeat in the stir fry with the yellow chilies. Still, this was one of the best dishes. The final dish we ordered, this one from the daily specials menu, was puu lon pak sot or salted crab and coconut cream stew with fresh vegetables. This is a dish that is less common for foreigners to try and one that I haven’t run across too many times. 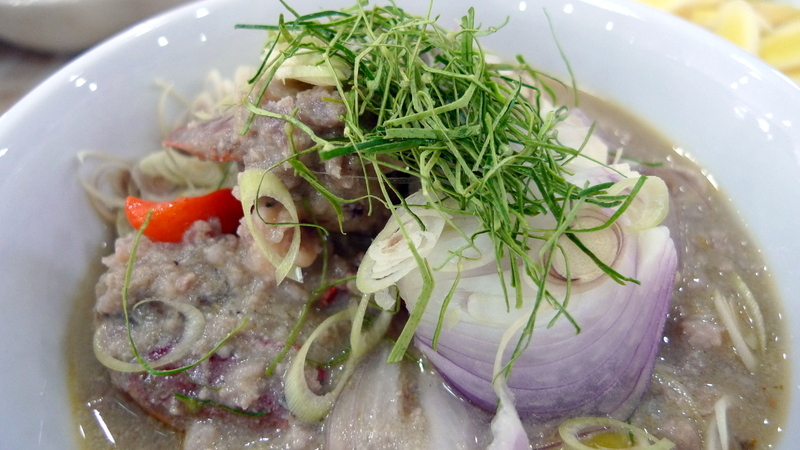 It is made of salted crab, minced pork, coconut cream, and a variety of herbs and spices, boiled until thick. 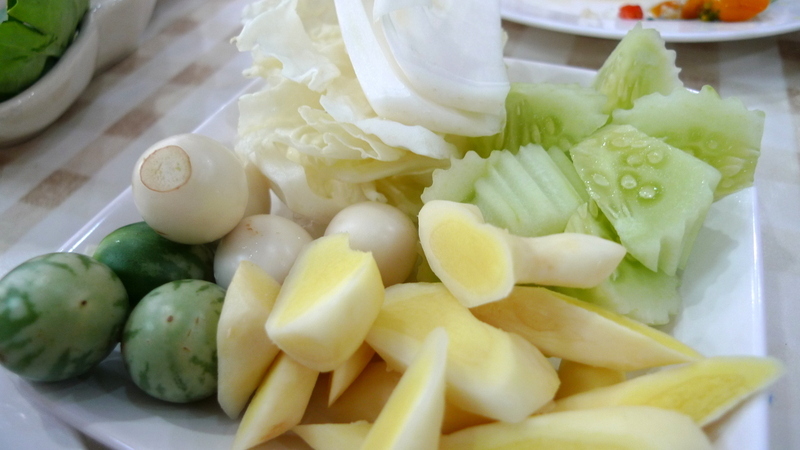 The dish is actually more of a dip than a stew, as it is served with a selection of fresh vegetables – two types of eggplants (including the white ones), tumeric root, cabbage, and cucumbers – with which you eat the puu lon. I found the taste of the dish to be interesting, both complex and unusual. It is a bit sour, a bit salty, and very herbal. Chow didn’t care much for it because it has sort of a milky aftertaste but it wasn’t a problem to me. 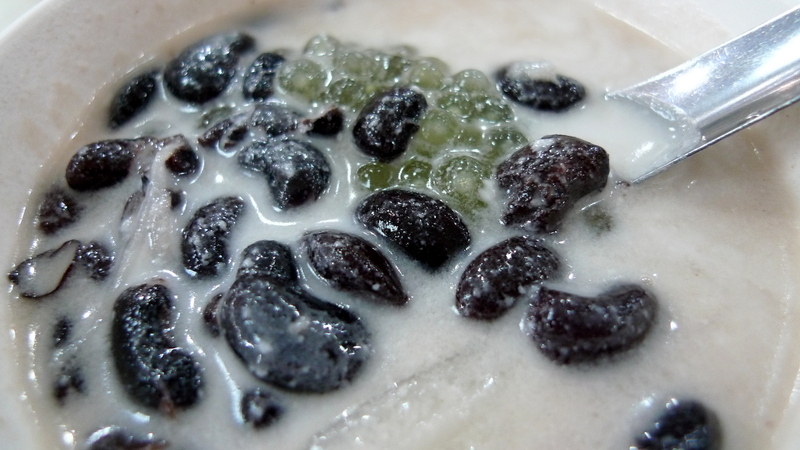 For dessert, we tried some of the homemade fresh coconut sorbet (which was refreshing but didn’t photograph well) as well as this saku biak tua dam – miniature tapioca with black beans, served in sweetened coconut milk. This is one of my favorite Thai desserts because it is not overwhelmingly sweet and has a bit of saltiness as well as the heartiness of the beans. What to think of the restaurant overall? You have to start out by understanding that this type of restaurant serves aahan juut, literally “bland food”. It is the type of food that appeals to your grandparents, comfort food that isn’t too assertive. That’s not a knock on the restaurant itself, because the food is well prepared with a lot of attention to the quality of ingredients and the methods of preparation. The flavors are relatively bland because that’s characteristic of Central Thai cuisine when compared with Northern, Northeastern, or Southern Thai. With all that in mind, Krua Apsorn delivers a good dining experience and value for the money. Is it worth seeking out? If you are already near the restaurant, it is worth stopping by. If you have to trek all the way across the city, there are probably other aahan juut restaurants closer by that will satisfy you just as well and, if you are visiting from outside Thailand, there are other restaurants I would recommend you try before you get to Krua Apsorn. This entry was posted in Uncategorized and tagged Apsorn, cuisine, Dining, food, Krua, Restaurant, thai, Thailand by christao408. Bookmark the permalink. I am dying from hunger! I want to get on a plane right now and try all the things there.Thanks for your wonderful description of the food! You should visit the Bay Area and do a review around here so I know where to eat. Food always looks so good on here. Do you Yelp? It looks delicious. I wouldn’t ever have the appetite to order so many courses, though. Would you say this place is for locals or for tourist types? Looking at those servings make me hungry. And to think that I just ate my lunch. Wishing you the best that the new year brings. [“…literally bland food.”]Hhahah, I wouldn’t have thought an eatery would like to be known for serving bland food! At the same time though, I could imagine this place being a decent first stop for nearly-arrived foreigners? Personally, there have been a few times when I was too eager to sample local cuisine and my body didn’t acclimate well to the full-on rush of new and extreme flavors. I eat asian food about 2 times a week. I have a hard time finding a good place because food varies all the time and the soups can be a bit bland at times. I’m thinking good cooks are hard to come by. I’ve a guilty secret. I’m lazy. Your posts are so thorough and detailed, encyclopedic in fact, that I (1) read the title and first two sentences, (2)gage the length of the article,(3) browse the gorgeous eye candy, (4) skim and cherry pick the paragraphs (5) and only then decide whether to consume the totality of it. If I read every word, I feel honor bound to Recommend. That’s because the content is invariably superb. Oh my – that’s a lot of food for two people. It’s interesting to learn about the many different styles of Thai food. Bland you say… I think it looks tasty. wow, you two must have been really hungry! i wonder if “bland” is a relative term… that food looks amazing. or maybe it’s the skills of the photographer, because all the food you post looks amazing! I am drooling. What a neat idea to make the omelete in a small dish. I should try that. Thanks to everyone for your comments. 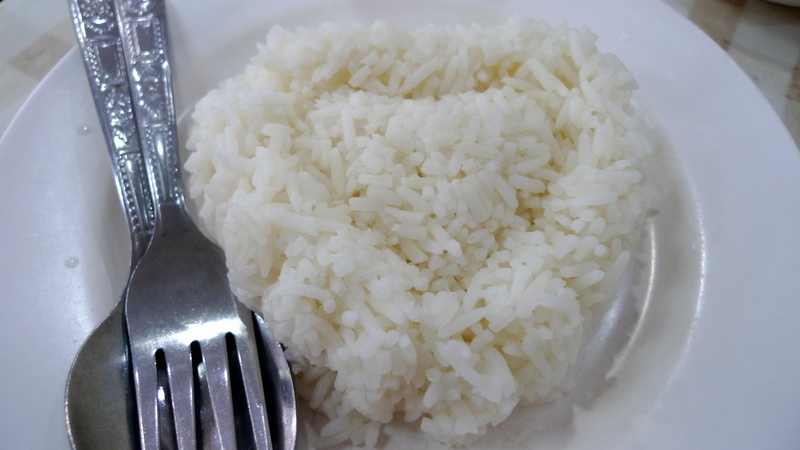 @murisopsis – I guess I need to clarify that when I say “bland,” the food served at Krua Apsorn is bland only in comparison to Thai food as an entire genre. Generally speaking, Thai food is one of the more assertive styles of food, with lots of chilies, spices, fermented shrimp, fish sauce, tamarind paste, lime juice, and herbs. @kunhuo42 – Thanks for your comment about the pictures, Aaron. Honestly, I think my camera, which is two years old or so, seems to be taking better food pictures as it ages! @I_love_Burma – Phut kwam jiing maak khrab! @rudyhou – Rudy, I’m sure Chow would love to make a new friend. When you’re in town, I’ll be sure to introduce you as the new volunteer set of taste buds. LOL@ZSA_MD – It really is a neat idea, isn’t it? @Inciteful – Thank you for your recommendation and your confession. I totally understand the challenge that some blog entries (including mine!) cause with them being too long. Many folks write like that and I never consider myself obligated to read it word for word unless I’m particularly interested in what they have to say and I feel like I have the time. @ElusiveWords – It was a ton of food for two people and I didn’t eat dinner that night! @jennfaceee – NYC (and even better – LA) has a lot of good Thai restaurants. @drung888 – Add things like jet lag and general disorientation and trying to adjust to a new cuisine too quickly is certain to set your stomach in motion! All things considered, Krua Apsorn would be a decent place for someone who has just arrived to dip their toes into the Thai cuisine waters. @The_Eyes_Of_A_Painter – Back in KC, I’ve stopped by the supposedly “best” Thai restaurant only to find not a single Thai in the kitchen… or in the front of the house. I think with any cuisine’s food, it is tough for the quality to be maintained if there isn’t someone really familiar with the cuisine to regularly check for consistency and accuracy of flavors. On top of it, most Westerner palates are not too receptive for the very different flavors of many Asian cuisines. What results is a bland, one-note (sweet) interpretation of the dishes. @CurryPuffy – You’ve probably seen the appetizer at Thai restaurants in LA, Gary. Pretty common. @Norcani – Many thanks and good wishes to you, too. @Ricardo98 – Thanks for the recommendation, Ricardo. Most of the customers are locals but there are certainly some foreigners. It is a good enough restaurant but there are others I would send visitors to before this one. @npr32486 – It’s been more than seven years since I left the Bay Area so I wouldn’t claim to know what is going on in the food scene there, especially in the South Bay. Sure, I have my favorites that I like to return to when visiting but I’m sure there are a lot of really good places I’m missing. As for Yelp, there was a great blog post in the OC Weekly titled “An Open Letter to Yelp Reviewers of Vietnamese Restaurants that perfectly captures my frustration with user-reviewed sites like Yelp. Bottom line: people who don’t have a basic knowledge of what they are reviewing should be very careful when stating their opinions. @slmret – Should have had a warning, huh? =D@Passionflwr86 – You could argue that any cuisine is an acquired taste, right? @awoolham – You’re so welcome. Jump on a plane and head over! @christao408 – it’s a deal!